The title comes directly from a sentence in an article by Andrew Loh , “Parental Guide to Understand Baby Brain Growth”. 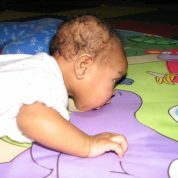 Recalling the first year of my 24-hour learning care services childcare business- after showing a parent the infant room, I asked her what she wanted developmentally for her child? With the most puzzled look, she responded, “I just want her changed and fed when needed.” This parent, a first-timer, had limited knowledge of the brain development of her child. As childcare provider, it was my challenge to help this parent understand how childcare affects the brain development of her child- colors and their meaning, communication, noise, close visuals defined, etc. The parent’s understanding of brain development is part of my business in my 24-hour learning care services childcare center. We have heard the adage, “What looks good, isn’t always good for us.” This can happen in the childcare business [remember this is about your child’s brain development]. The environment can ‘look good’- having the right colors, space, items placed just so but the student/staff ratios could be a bit much. There are states that still use the 5:1 ratio for infants- 5 infants to 1 staff. That staff person makes or breaks the environment, as they are such a large part of it. They make that environment come alive or make it tolerable.The flip side of this scenario- environment is tolerable and the staff is excellent. ‘Tolerable’ is not a word that should be desirable for childcare choices. We give you a visual to help understand how staff is directly related to the quality of the environment for development of your infant’s brain circuitry. Understand this is for an 8-hour time frame. Things needed: you, 5 stuffed animals, bottles, diapers/wipes, clothing. What could happen? Sitting on the floor, please place the 5 stuffed animals where you can have physical contact with them. Remember: when one cries they all join in. How do you handle the greater stress created when all are crying or screaming as you can’t get to everyone’s needs as they demand? Is the answer to put them on a “schedule” [feed, diaper change, and sleep] that makes it easier for staff? Are they thriving in this environment? Brain development happens in positive and in tolerable environments. How much brain development has occurred in the above questions. There are tolerable childcare infant rooms where “scheduling” happens every Monday-Friday- the norm. Essential childcare is a large part of today’s parents needs. Your post was very informative. Thank you for that. the two environments- home and childcare, are my concerns; will my child be able to transition? I am worried and try not to show my child. Please contact me.